As we previously documented in Complications & Problems Selling Rental Property, there are A LOT of decisions to be made and a lot of laws to be considered when landlords decide they want or need to sell their rental property and a lot of it depends on factors that are usually unknown at the start of the process – such as, whether the buyer you haven’t met yet is looking for a private residence or a rental property and whether they would prefer a sale with sitting tenants or vacant possession. If landlords selling tenanted property choose to leave tenants in situ during the sale it could cause problems showing the property but if they vacate the property too soon, it could cost them thousands in lost rent. The best option, of course, is to leave sitting tenants in situ as long as possible but not so long that it causes problems. Timing, speed and legal advice are all crucial to getting the best results for landlords selling tenanted property. National Residential specialise in selling tenanted (& sub-tenanted) property, often with additional complications like short leaseholds or absentee freeholders. Landlords often assume that tenants who object to viewings (usually on the grounds of ‘their right to quiet enjoyment of the property’ for the sake of simplicity) are being awkward when in fact there are a number of personal reasons tenants might have for not wanting to agree to arrange their schedule around the landlord’s objectives. Some tenants might not be comfortable discussing their reasons with their landlord and can include factors such as: inconvenience (unable to take time from work to be present during a viewing), embarrassment (re. cleanliness, possessions etc), concern, anxiety, privacy, principle (misguided or not, that while they are still paying rent they should not be expected to be inconvenienced), an infringement of their option to make spontaneous plans or ‘other’ (e.g. landlord support if something bad happens as a result of the viewing). Unless the tenancy agreement includes a clause stopping tenants from changing the locks without permission, legally tenants are allowed to change property locks with reasonable cause for concern. Any form of harassment or bullying (landlords trying to force tenants to grant permission to enter the property through intimidation or repeated requests from friends, family and associates) or emotional distress could be considered ‘a reasonable cause for concern’ and the tenant is not required to give the landlord a key unless stipulated in the tenancy agreement. Repeated, unlawful entry into a tenants’s home or a landlord turning up to the property without the agreed notice could be considered harassment. Legally, a tenancy grants the tenant exclusive possession to the space they are renting – i.e. the right to exclude the landlord or their agent subject to any rights of entry the landlord reserves. To ensure a landlord can have occasional periodic access to their property and more frequent access at certain times, many tenancy agreements include clauses such as ‘access to perform checks and repairs with 24 hours notice’ and ‘the right to show the property after a tenant gives notice to quit’ or ‘in the final month of tenancy’. However, if a tenant refuses to permit entry in contradiction to the tenancy agreement, it only entitles the landlord to pursue legal action under a breach of contract – it does NOT legally entitle a landlord to enter their property without the tenant’s permission. Unlawful entry by a landlord to a tenanted property can be considered as trespass or an invasion of privacy or a breach of implied covenant of quiet enjoyment or emotional distress and a tenant could take action to claim damages or an injunction to prevent entry by the landlord/the agent. Any illegal response to a breach of contract can be pursued by the the tenant through the courts (sometime without incurring any cost or risk to themselves) and if the court awards in the tenant’s favour, a landlord may face heavy fines and/or damages because two wrongs never make a right – neither in folklore nor in courts of law. The legal standing of the advice given to landlords by solicitors can be factually correct but counter productive to a fast, happy, successful resolution. If a landlord wants to sell a tenanted property, they should of course know their legal standing and use it to their advantage HOWEVER pursuing a breach of contract through the courts can be a complicated, expensive and lengthy process that can result in significant delays to a sale process and potentially, a loss of income that may not be recoverable regardless of a court ruling if the tenant’s financial circumstances does not permit it. It is an option that National Residential are happy and equipped to use but we consider it a last resort, not our first course of action because pursuing a legal ruling through the courts may be a slower and more expensive option than negotiation and compromise while it may not be in a solicitor’s own interest to recommend a similar strategy. NB. 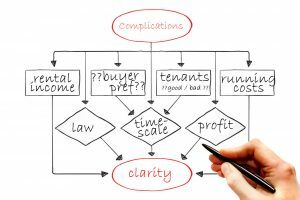 Please note, this article DOES NOT constitute legal advice – it is only intended to demonstrate the complexity of the problems and range of options selling a tenanted property. You you should always get legal advice before making any attempt to sell a property with sitting tenants or subtenants to ensure your tenants’ legal rights are not contravened during any process. Whenever it is prudent to do so, National Residential will always try to get a tenant to cooperate and participate in viewings through incentives and ‘soft’ bargaining options – such as the assurance of a good reference, guaranteed return of their deposit ahead of schedule and/or ignoring minor misdemeanours that are not illegal – e.g. keeping an unauthorised pet. While we always act in the best interest of the landlord, we use our lack of emotional involvement to position ourselves as an intermediates – focusing on the best possible outcome for all parties rather than negative emotion like frustration and/or anger or purely the legal standing of either party. We make sure tenants understand that any incentive we offer is provided by National Residential, is conditional and we have a team of housing law experts available to pursue legal action if required. A significant number of London properties we sell are tenanted properties. Due in part to the high living costs and profits from subletting, appx 65% of those properties are sublet. Many also have other complications such as missing freeholders, short leaseholds or pressing urgency. Our most popular sales option to sell tenanted property is our fixed price option. We agree a price the seller is happy to accept for a quick, hassle free sale of tenanted property. Once we have received a guaranteed offer for the property we can release funds into the sellers’ accounts while we try to make a profit from the sale by getting a better price. Sellers do not have to wait for completion to receive funds. Sellers are not liable for any fees, expenses or commission in our fixed price sales option – simply agree a price, wait for a sale then leave any hassle or worry about sitting tenants to us to sort out – none of it is your concern after that point. For sellers, we offer the ease of a fast sale and the comfort of handing over problems for us to solve as well as a very competitive price with no costs, fees or commission plus the security of a ‘simple walk away’ policy (no hidden charges) if we do not find a buyer for your property. For buyers, we offer the reassurance of experience. We have refined our practices according to proven strategy – we know what works and we know what doesn’t. We have skilled negotiators with an arsenal of legal advisers at hand if required to hand over the property tenanted or with vacant possession in an agreed timescale. Contact us now on 01244 757152 (mobile friendly) or 0800 612 3694 (free phone) to find out how we can turn a complicated problem into a simple solution and sell your tenanted property fast. As members of The National Association of Property Buyers, we have signed up to The Property Ombudsman Code of Practice so consumers can expect a fair and transparent service when selling their home to a member agent, with the additional peace of mind that they can access TPO’s free, impartial and independent dispute resolution service in the event of a complaint.